Water Street Home World Toilet Day. If We Can’t Wait, We Simply Go. World Toilet Day. If We Can’t Wait, We Simply Go. Based on the word “toilet” in the headline, you might assume this blog consists of important messages about toilet-to-tap technology or fixing toilet leaks. But this week, I’m writing in support of and respect for World Toilet Day, which is November 19. 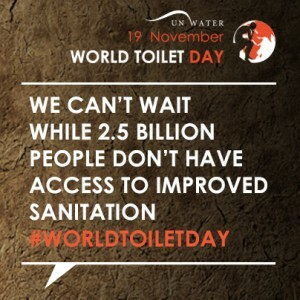 Since it was launched in 2001, World Toilet Day – founded by the World Toilet Organization (WTO) and backed by the United Nations – has brought to light serious toilet issues focused not on water conservation, but on sanitization. Yes, the idea of a World Toilet Day may induce giggles for many – after all, we have the luxury of knowing, if we can’t wait to go, chances are we don’t have to… a clean, safe facility is sure to be nearby. Even though we rarely think this way, being able to go when we need to go IS a luxury. And so is being relatively assured that the bathroom we choose is sanitary, safe and equipped to meet, at the very least, our basic toilet needs. 40% of the world’s population lacks sufficient access to toilets and waste infrastructure. Clean and safe toilets help keep girls in school – studies show girls miss out on education due to lack of a clean and safe toilet. And a concept I find particular eye-opening: there is a powerful link between gender-based violence and sanitation. In fact, this dynamic is so profound, it was made the focal point of World Toilet Day 2014. The prevalence of open defecation has made millions of women and girls especially vulnerable to violence and abuse, and with tagline “We Can’t Wait,” the World Toilet Organization is calling on everyone to take notice, generate awareness and take action to help change the tide. In this context, maybe “luxury” isn’t the most appropriate term for having sanitary toilets available – it’s more of a basic human need and a basic human right. World Toilet Day is a time to appreciate our resources, grow our awareness and do our part to help others less fortunate.